Cherryleaf can lead your documentation projects and sprints. We can also provide Technical Authors to write the online Help, onboarding screens, embedded Help, or a knowledge base for your product or service. Poor or missing documentation is one of the key challenges for open source projects. It’s very difficult for an open source project be successful without documentation that describes its architecture, or explains how to use the software. Many developers don’t like writing documentation. They have to deal with the “curse of knowledge”. This means when we know something, we find it hard to imagine what it was like not to know it. However, documentation is essential work. We mean Help that’s delivered as a set of HTML files. These can be in a knowledge base, a Help section, or linked to your support ticket system. 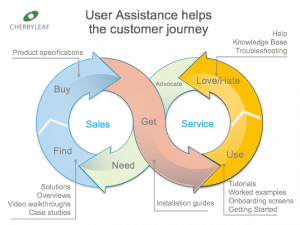 This type of Help is used for Software as a Service, other web-based applications, and mobile apps. It can also be used for desktop applications. Onboarding screens introduce the application to the user, and demonstrate what the product does. Cherryleaf can help you create your onboarding screens – getting the content and the design right for your product and your audience. UI text and Embedded Help places the Help information in the application screens. The user doesn’t need to leave the current screen to find the answer to their questions. We write the Help in text or Markdown format, which is then compiled with the application code files. We can also create print versions in PDF, Word, or another printed formats. We often use a single sourcing and topic-based authoring approach. This means you can publish content to a range of different configurations and outputs. You can also provide a more personalised experience for the user. Making any existing content clearer and easier to use. Writing new content for you, where it's missing. Organising the content in ways that make it easy for people to find the information they need. Deliver the content in different formats. Subsets delivered for different outputs. Personalised content for different job roles, location etc. Create it once, and re-use it multiple times. Automate the exchange of content with other systems, so others can use your content in their outputs. Have a preferred authoring tool or working method? We can use a writing process that suits your workflow and technologies. Cherryleaf works with a wide range of authoring tools. Need help in writing the documentation for your open source project? Complete the contact form below. Don’t worry if you don’t know the answers to all of the questions. We will contact you to discuss your situation and requirements. You can always phone or email us, if you prefer. Can you tell us how much content is needed? Tell us a little about your audience, timescales and budget.